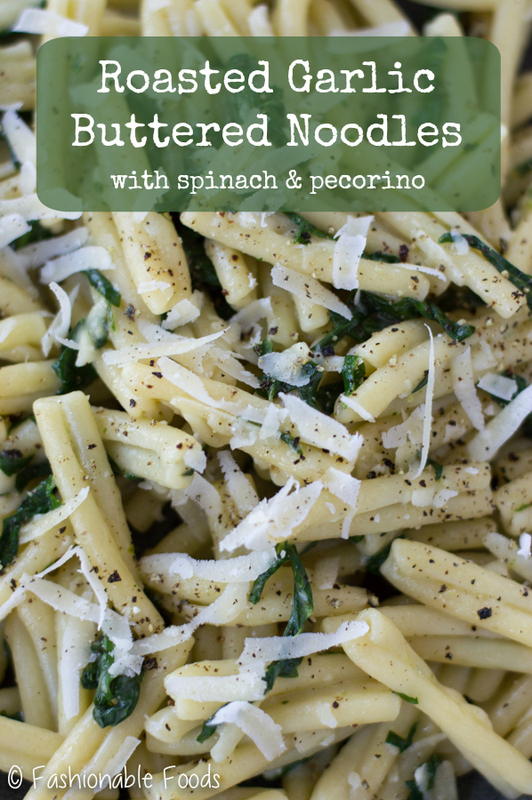 A grown up take on a childhood favorite: buttered noodles. 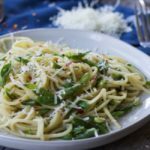 Roasted garlic buttered noodles use a flavorful compound butter, fresh spinach, and pecorino romano cheese for a fancy take on the classic pantry pasta. Roasted garlic + herbs + butter = the best pasta sauce. We’ve also got some spinach and cheese in there because I love greens in my pasta and who doesn’t love cheese? Not only is this pasta delicious, but it’s really easy and makes for a nice grown-up version of my childhood fav: buttered noodles. Who am I kidding? They are an adult fav, too. Whenever we need a quick dinner the answer is one of three things: quesadillas, Annie’s boxed mac & cheese, or buttered noodles. There’s just something about buttery pasta that tastes so good and brings so much comfort. Probably because it’s a nostalgic food for me, but seriously who doesn’t love pasta tossed with butter?! 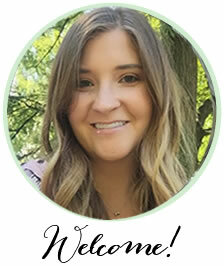 It was especially comforting during the first (and part of the second) trimester pregnancy nausea. Although those noodles were just butter and salt because the thought of anything else mixed in definitely didn’t sound so good. Today we’ve got the grown up version! 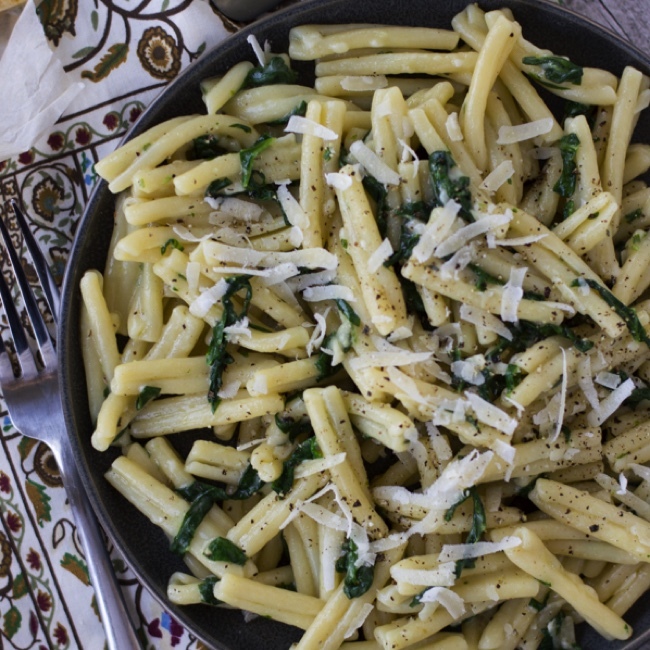 The base of this pasta dish is the roasted garlic compound butter. We roast a whole head of garlic and then mix it with a stick of butter and fresh herbs. 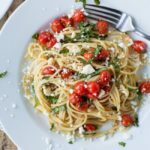 We only use half of the compound butter to toss with pasta so you’ll have enough leftover to make this dish again or use it for something else! You can freeze the extra, which is super convenient to have on hand for various things. This roasted garlic compound butter doesn’t have to be used only for pasta, you can make garlic bread, top meats with it, or toss veggies with it. 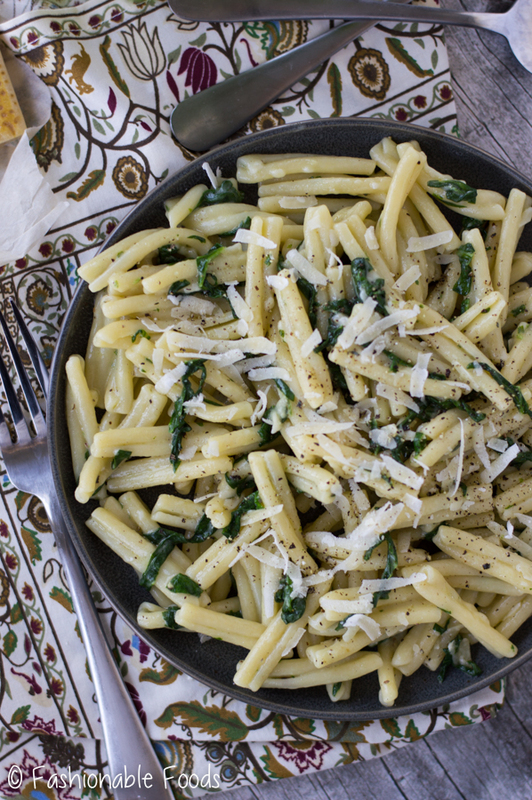 Once you have your compound butter made, you’ll toss it with some cooked pasta, fresh spinach, and cheese. Yum! Let’s talk about the pasta shape. 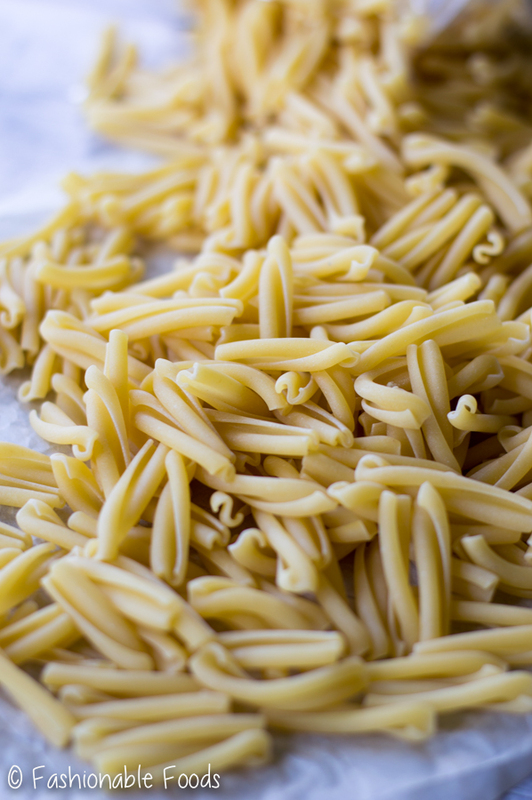 Whenever I’m making simple pasta dishes I love to use a specialty type of noodle. In this case it’s casarecce, which I LOVE. Of course you can use any pasta shape you want here, but if you can find casarecce I highly recommend giving it a try. 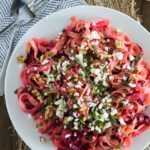 It’s also really delicious tossed with pesto! There you have it! Roasted garlic buttered noodles, the grown up version of a childhood classic. They are simple, delicious, and addictive! Place the head of garlic in a small piece of foil and drizzle lightly with olive oil. Season the garlic with salt and pepper and wrap the garlic up tightly in the foil. Roast in the oven for 30-45 minutes, or until very fragrant and the garlic is soft. Set the garlic aside until cool enough to handle. Bring a large pot of water to a boil, generously salt the water before adding the pasta. Cook the pasta according to package instructions to al dente. Reserve 1 ½ cups of the pasta water before draining. In a mini food processor, add the butter, parsley, and fresh thyme. Squeeze the garlic from the peels into the food processor and season the mixture generously with salt and pepper. Process the butter mixture until smooth, scraping the sides as necessary. 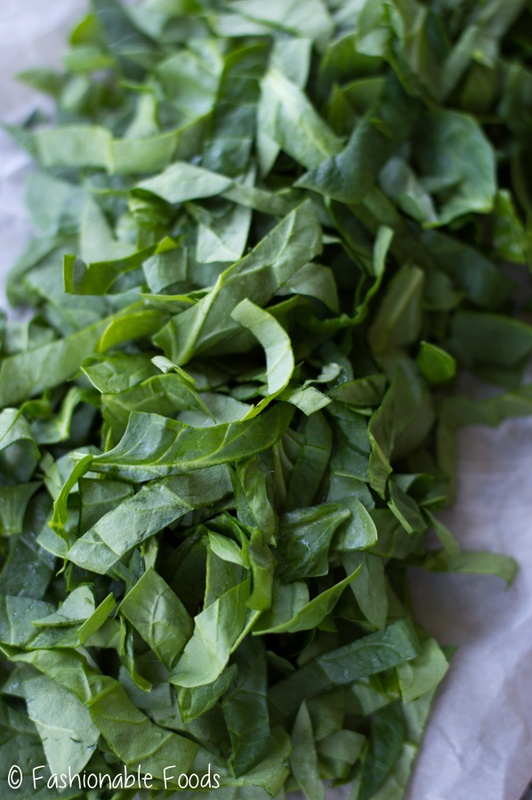 Once the pasta is cooked and drained, add it and the fresh spinach to the hot pasta pot along with about half of the compound butter. 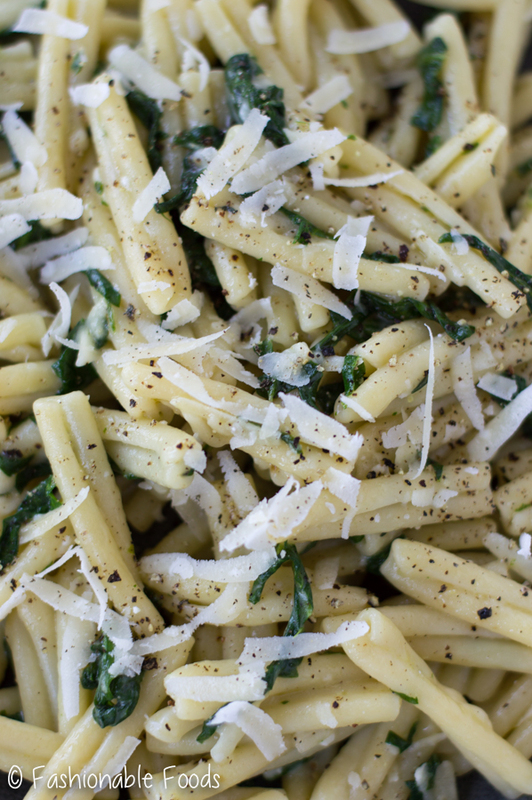 Stir to coat the pasta in the butter and wilt the spinach, adding pasta water as necessary to create a buttery sauce. Toss in ¾ of the cheese and mix well. Taste the pasta and season with salt and pepper if needed – I like lots of black pepper on this one! Serve the pasta in serving bowls topped with extra black pepper and more cheese. This looks like something my son would love. Thanks!